Known as "Fi" for short, the shoe uses a custom motor to tighten and loosen, according to Bay McLaughlin. 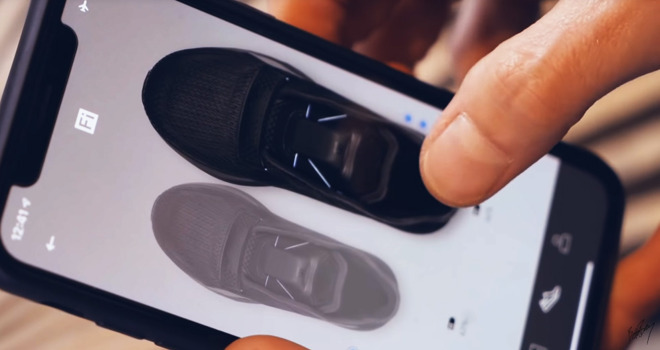 Owners can adjust it manually using on-shoe swipe gestures, or with upcoming iPhone and Apple Watch apps. There are three tightness levels -- unlike Nike's Adapt BB though, the Fi won't automatically adjust while being worn. I'm all for more functionality and accessories, but I sure wish Apple would fix the bugs in their fitness software. I get monthly "challenges" that go away after a few days. Things like "do 45 workouts this month" to get an award, then a few weeks into the month, the challenge simply disappears. Sometimes a different one appears. I upgraded my wife to AWs3 because she really likes the fitness tracker. Just this morning, she reported, "I finished my challenge for January a few days ago, and today the badge simply disappeared." I really like giving gifts that disappoint. A small thing for sure. I didn't really buy AW for the fitness stuff, but I do actually use it now. I just wish it worked consistently. Oh, and AW requires a restart about every 3 days, or else the workouts drain the battery completely in about 30 minutes. A 30 minute walk in the morning takes the battery from 95% to like 30%. It is then dead a few hours later. It isn't the battery either, because if you reboot the watch overnight, the problem doesn't occur. Wow. Competition is getting intense. Maybe “Find My Sneakers” app should be next. Sneakers with built-in Bluetooth Bose speaker? The bass would be so loud that it shakes baseketball court. Finally! Do you know how many times I'm in the middle of a game a think to myself: I wish I could go pick up my phone now, unlock it, open the app and tap on tight the laces up button. My life will be complete now! Apple should partner with more fitness brands and make Watch even more flexible.